Camping breakfast. Start the day off right with a great one and you will be a star for the rest of the vacation. After all, it’s the service that makes camping so fantastic. This is not a how to cook article. It’s not an instruction manual on how to fry the perfect bacon strip, or how to flip an egg. Not even a guide to cook up a perfect plate full of food. Instead, I give to you a recipe on how to give your wife a little time off in the campground. Presenting her and the family with your best breakfast served with all of those little things your family will remember for a lifetime. The food is secondary. It’s all in the presentation. You be the Man. You must be up out of bed first. This is very important. You want to spoil the family. This is the one opportunity to show your true colors. You are waited on all of the year. Your family will love you for it so get ready to reap the rewards. Make a campfire. Apart from the great food you are going to prepare and all of the service you will soon perform, the campfire is very important. It will crackle and smoke as it gets up to steam. That is what makes camping fun. Years from now that smell will be the first thing gathered from the memory bank when the word camping is spoken. Cook outside. You are Camping. Don’t prepare the breakfast inside the RV. What fun is that? Since you got out of bed first, let the others take their time. As soon as the aroma of your culinary delights will hit their noses, they will come alive and you will be their hero. Make the coffee or tea first. Is there anything that smells so good as fresh coffee or tea first thing in the morning? The aroma will permeate throughout the tent or RV. In no time, without prompting, people will want some and get up. Cook up the best breakfast you know how. Keep everything hot. Warm up the plates either on the other burner of the stove or near the campfire. We use paper plates when we camp. Makes clean-up a lot easier. 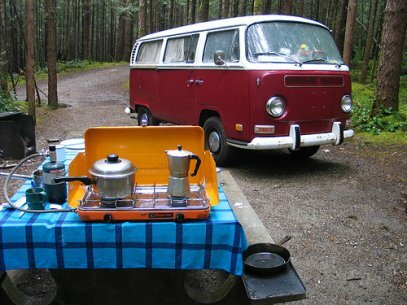 Now serve the great camping breakfast outside, if the weather is good for it, or bring in doors if necessary. This is what camping is all about. The family will love you for it. There you have it. I have always tried to be the chief cook and bottle washer on our family camping trips. After all, my wife is forever cooking and cleaning for me and the rest of the family for the entire year. I always felt the least I could do for the few times we go camping would be to be proactive. I will be the knight in shining armor who my wife thought she married. A cheap lightweight travel trailer can provide thousands of hours of fun just was the giants while rv camping. Even car camping with your best family tent set up at campsites in camping parks is a good way to go. RV campgrounds sometimes have family camping sites set aside near the playgrounds so the noise will be confined in one area. Tent campgrounds may be set off towards the beaches in some caravan parks as the British call them. They take caravan holidays whereas we take camping vacations in America.